This is a very healthy recipe, ideal for fussy kids where moms like me can push in any vegetables and make it tasty. This dish can be prepared within minutes and is heart warming for winter evenings. 1. Boil the macaroni with a pinch of salt till al dente. 2. Heat oil in a pan. Add onion and fry till they are translucent. 3. Now add all the diced vegetables except tomatoes and spinach and fry them. Add little salt and sugar to the vegetables and continue to saute them. 4. 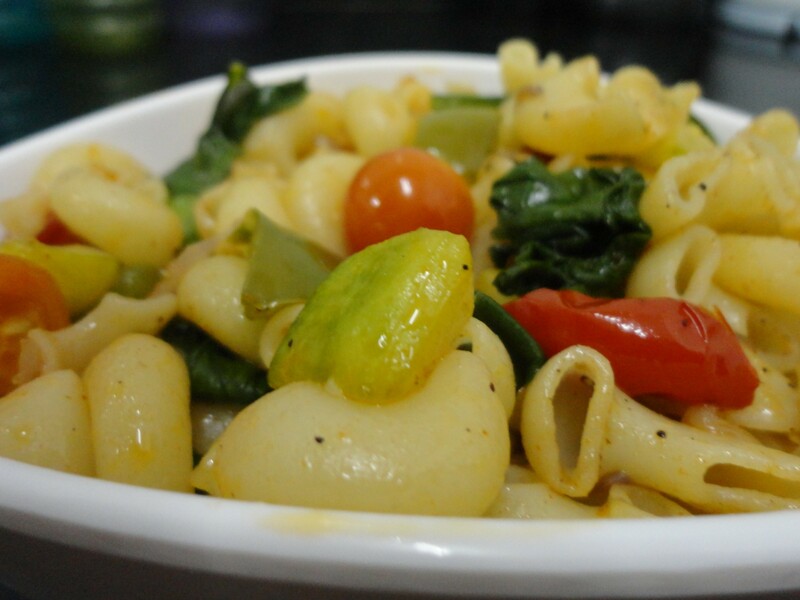 Add the boiled macaroni to the vegetables along with the spinach leaves and tomatoes. Please ensure that the macaroni and vegetables are mixed well. 5. Now add the red chilli powder and pepper to the mixture. Add salt if required. 6. Add one tbsp butter to the macaroni before taking it off heat.